Looking for 21st Birthday Poems? Look no further...we have lots for you. Doubling up also as 18th Birthday Poems..just change 21st to 18th. Please remember this is the World Wide Web and 'Coming of Age", "Drinking Age", "Key of the Door Age" varies around the World. That's good, nay, nay great. 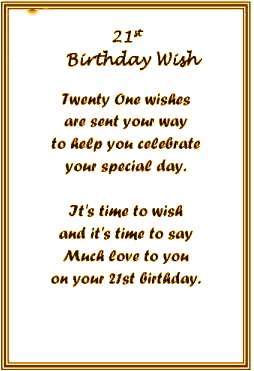 These birthday wishes messages are sent..
It’s a very special page. Just coz you’re 21 (18), don't go letting common sense get in the way of doing things everyone else knows are impossible. The first twenty one (eighteen) years are the longest half of your life. Finally 21 (18), and legally able to do everything you've been doing since 15. You are at the age where you can legally get paralytic and lose your money from gambling. Have a wonderful feeling, a wonderful day!